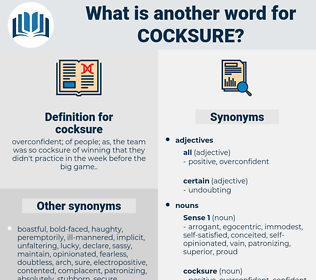 What is another word for cocksure? 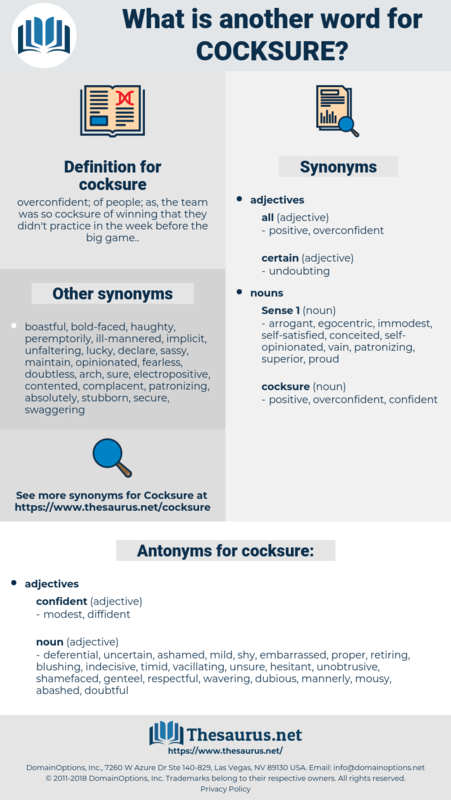 overconfident; of people; as, the team was so cocksure of winning that they didn't practice in the week before the big game..
deferential, uncertain, ashamed, mild, shy, embarrassed, proper, retiring, blushing, indecisive, timid, vacillating, unsure, hesitant, unobtrusive, shamefaced, genteel, respectful, wavering, dubious, mannerly, mousy, abashed, doubtful, gentle, courteous, polite, inconspicuous. You're too cocksure about it, Mac. None of them have, sir; I'm cocksure of that.